“Fakes and Scams,” some of the famous recent ones. NOTE TO NEW COLLECTORS: Fakes abound! 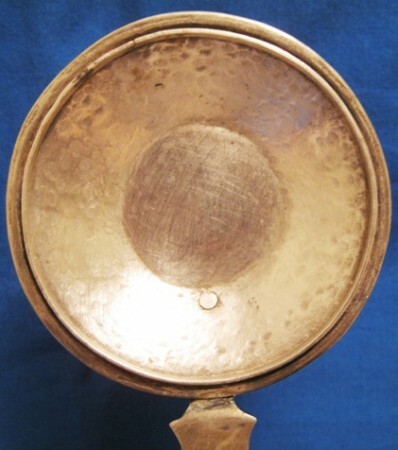 Especially in what is called “Russian Silver” and it has been done in vast amounts. 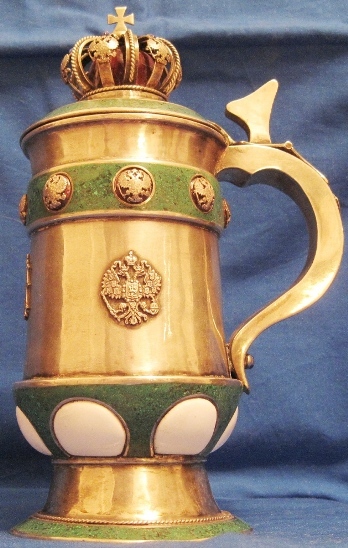 Even before their revolution the famous Russian -smith were making highly collectible and sought after pieces for silver / tankard collectors all over the world, therefore the reason for the fakes and reproductions. So: The number one lesson = you must learn your maker’s and town marks and the country’s marking system before you spend more than $100 of your “stein money” on something you are not 100% certain of. 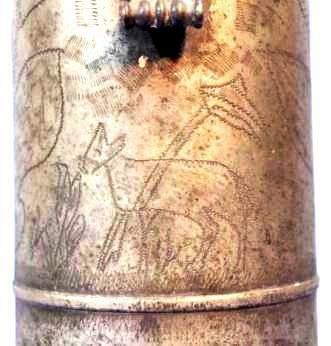 Fayence fake steins / out right fakes – Made sometime in the mid 1900’s (60’s to 90’s ) they come with really terrible lid pewter work; indistinguishable maker’s marks on the lid; faux crazing; and a body style (pear shaped) not much seen in Old Germany per se. Photos are blown up so hopefully the viewer can see the crazing. Some of these have been offered on eBay for 1,000’s of bucks. Be careful out there folks! A piss poor quality molded lid and the marks are terrible too. 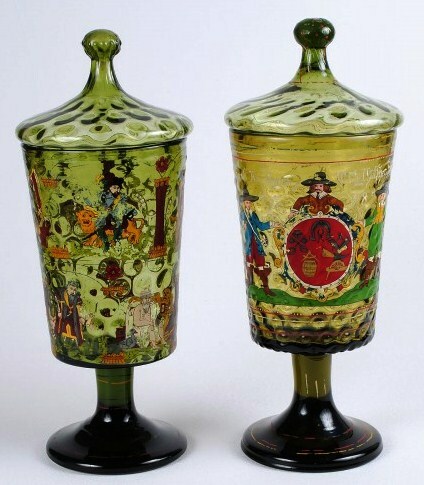 A stein collector and friend of mine recently bought this piece off eBay. 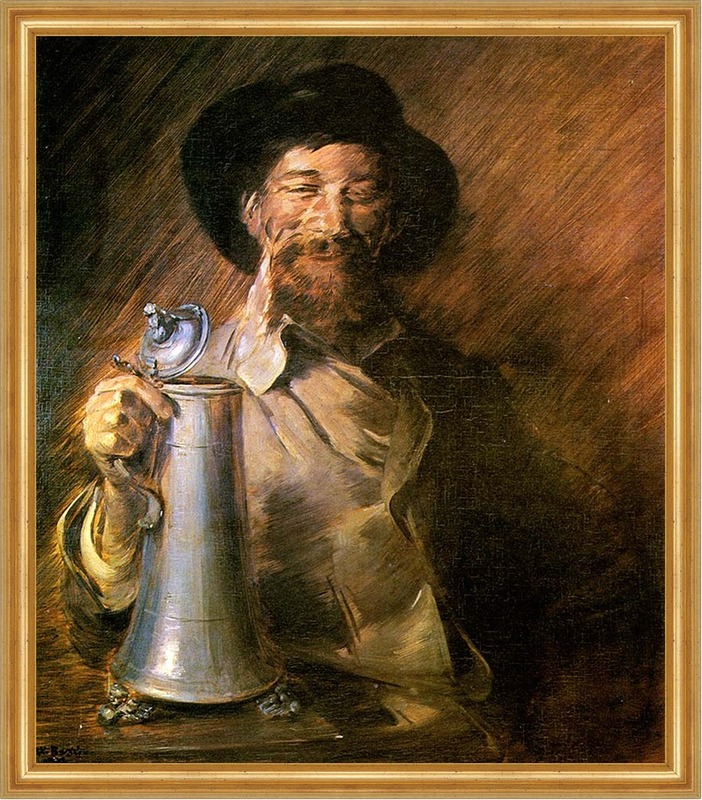 It was advertised as a gilded Russian silver stein and made by the Master, Pavel Ovchinikov. (which would make it pre-revolution.) When he received it he had some questions about its authenticity, so he emailed me wanting my opinion. 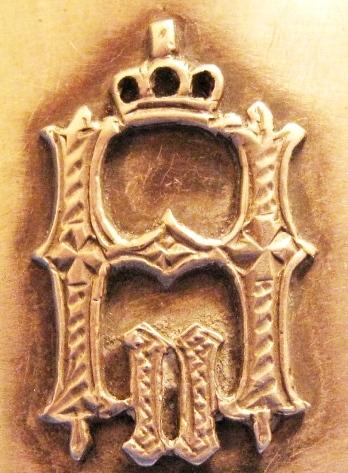 The Russian Imperial “Warrant”, (double headed eagle mark) is not well defined, nor is the makers name. If even a six month’s journeyman in a professional silver shop made something this bad (lack of crisp detail = that crown is terrible! ), he would have been taken out and shot! Not really, but he might be escorted over to the swine herder’s guild that day! Very thin silver throughout. Old Russian silver is very substantial. No finishing / polishing on the underside of the lid. One can see un-buffed scrape marks. My friend got his money back. He was very lucky! 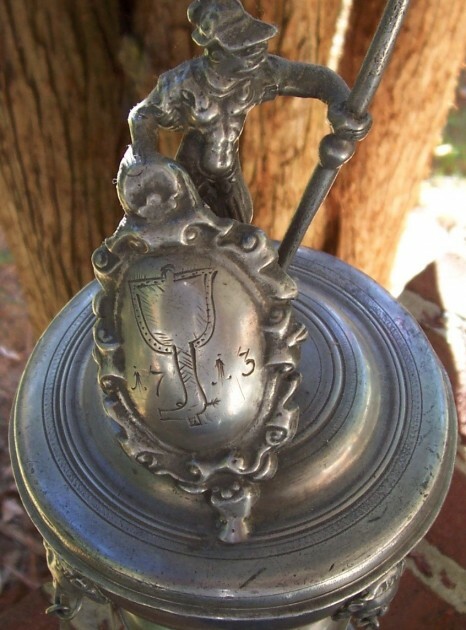 Most especially in silver, but also in old pewter, fayence and regimental steins! 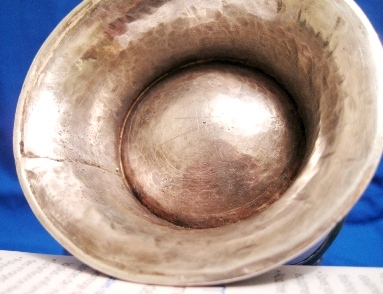 Called Russian silver and also French silver and all sorts of stuff on eBay. It has been listed primarily by one dealer under different names on eBay over the last couple of years. 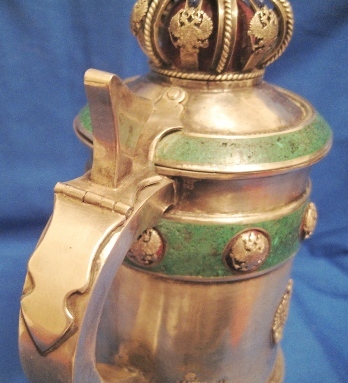 This massive and very heavy stein I believe is nickel plated bronze (as I have one.) 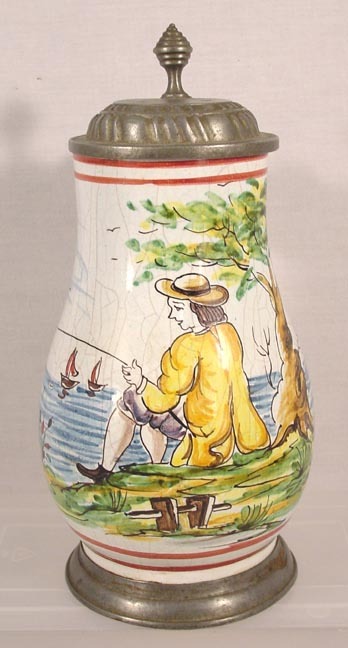 It is a copy of a Dressden porcelain stein made about 1860- 70. This was made unmarked and any mark on one will have been recently added. Biggest “scam’ to date ! Since then it has been advertised on eBay at least twice in the last year, and the copied photos from the Skinner’s catalog have sold twice= not the stein!! Usually the stein asking price starts ver y low and only has about 2 or 3 photos . When asked the first time it appeared the dealer sent me more photos, one of which still showed the Skinner’ s auction tag. The dealer changes his eBay sellers names and has about 15 transactions of which about 10 are buys and 5 are sell for really low end items . So far this has cost eBay and PayPal (if fraud was proven ?) at least 12, 000 !! I notified the “eBay fraud section” (which is a fraud in itself) and they said they couldn’t do anything unless i was the owner of the piece, or the one that had posted the original. 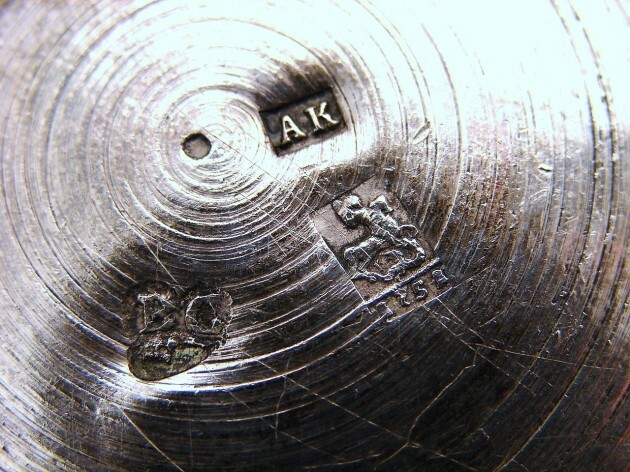 Fakes: I have seen this ▲sell with all sorts of maker’s marks on it; sometimes attributed to “Ovchinikov”, one of the top in his class pre-revolutionary Russian silver-smiths., but other famous silversmith’s names are used also. 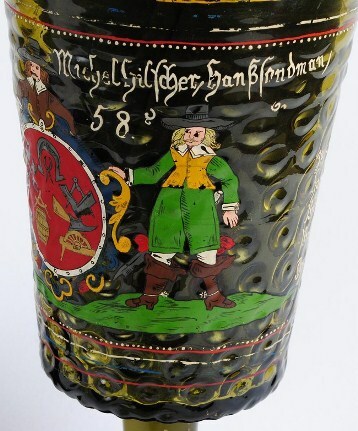 There are several versions of this stein above with the very same large molded horse’s head on them, all in different location on the piece. The one stamp [a] may be all in a line. the two stamp [b[ can be in a one line with the other very close by as shown below just below ▼. ……..and not on the body which is where the English stamped theirs ! Also normally these fakes will be found having no more than just one quality mark [= 84] most often ] stamped on the body, this is another certain “fake” giveaway; as the Russian rules required every major attached piece of an object to be quality marked! Lots of New and ignorant [or unread] collectors are fooled massively each year by not knowing or reading up on this and other requirement forsilver marking before they go and piss away a lot of money! Why they assume the seller knows what he is talking about, or is honest, always amazes me!! New/ or fake: If this piece is sold as an “old ” one, because it has one “84” mark on it then it is should be considered a fake. 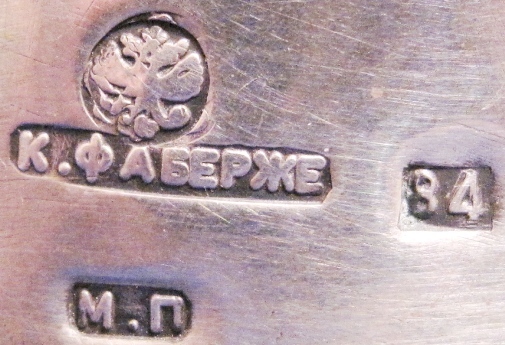 I do not think it has a maker’s mark on it, and as required in the old days each separate piece of silver is not marked –so I think this is newly made in one of the Russian provinces (As close to China as one can get!) I have seen a few selling on the net over the last couple of years. 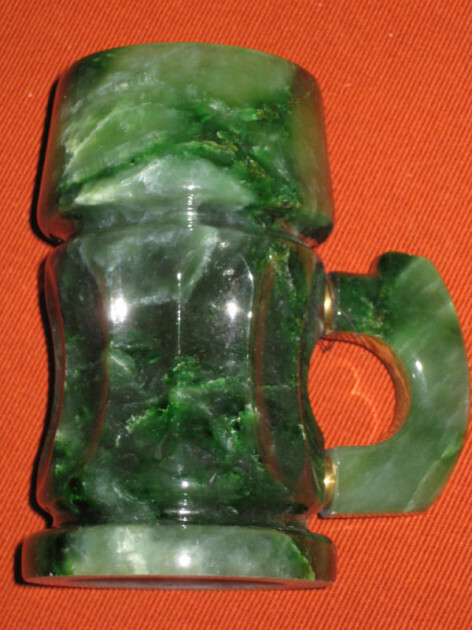 RBAY AD March 20214, it read” Quality Genuine Russian Carved Jade Mug Heavy”Starting price was -$468.00 And the Seller had 2-available! At least he stated the jade was new! Hell of a coincidence that these are still being made and “antique” ones with silver mounts as shown just above are showing up at the same time, hey?? Fakes of course do not have to just come in silver. 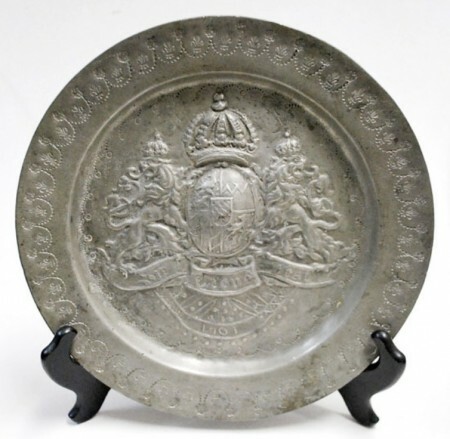 Here’s a very recent example of a pewter charger / plate advertised for about $400 on eBay. 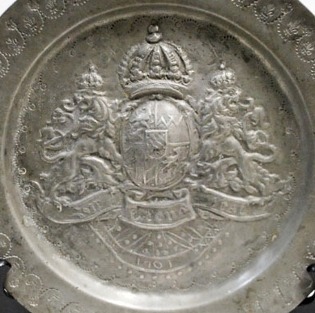 “Dated 1701” the ad says and one can see that date on the plate in the photo. If one is a stein collector for more than six months, then he / she probably knows that the shown Coat of Arms (not crest) is that of the State of Bavaria in Germany. 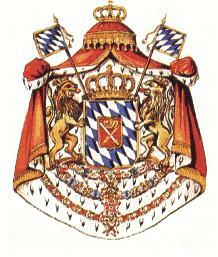 The oldest arms for Bavaria were identical to the Wittelsbach arms. In the 15th century the arms were used as shown above; a quartered shield with an orb in an escutcheon. The orb was a symbol of power and influence. The crests are from Bavaria and the Pfalz, the head is the head of the Counts of the Pfalz. The arms were used as such until the 18th century. In the early 19th century the family increased their possessions and the original arms of the family were now surrounded by 16 smaller shields. These arms were for personal use and were not used by the Kingdom. 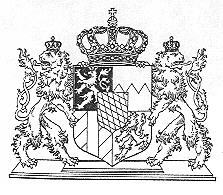 The arms of the Kingdom of Bavaria were much more simplified; showing the old Wittelsbach arms with an escutcheon. 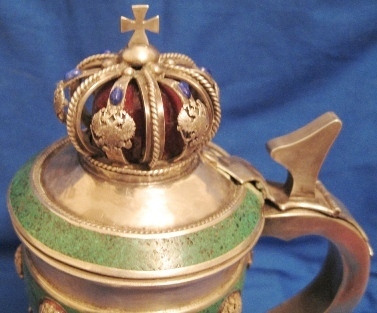 The escutcheon showed the Royal regalia, scepter, sword and crown. As supporters two lions were used and the arms were placed on a royal mantle of ermine. 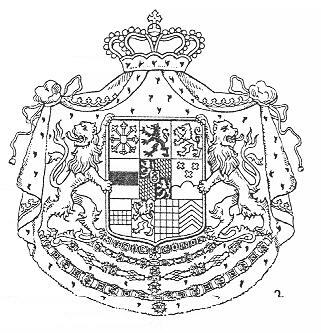 As in 1835 the official title of the king was : King of Bavaria, Count of the Rhein-Pfalz, Duke of Bavaria Franken and Schwaben, it was necessary to enlarge the arms with the territories mentioned. 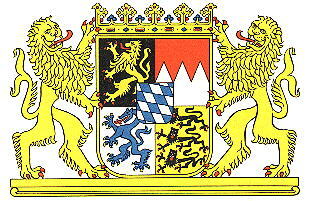 This resulted in the arms shown below, with Pfalz, Franken, Burgau (for Schwaben, the area of the Staufen family) and Veldenz. The arms could also be placed on the royal mantle. The arms of June 1950 . These are all “fake” and made within the last 35 years, mostly for the German and American Nazis Fans These are not reproductions as there never were any real ones! 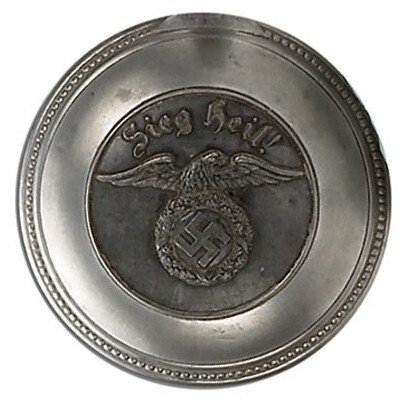 Anyone who buys one of these ….especially with the story that some American GI originally found it in an German’s home’s attic after the war was over…….. and believes that, well “join the club” as there are lots of you out there. Shown above: The most recent addition to a big crop of Nazi brand new pieces . 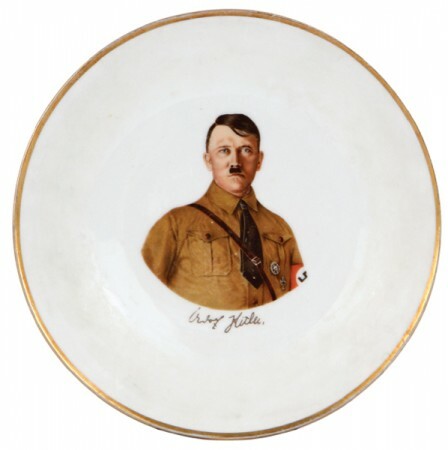 To make matters worse it was recently sold by a USA stein auction house as being authentic! As I have said before “The pewter is still hot!! 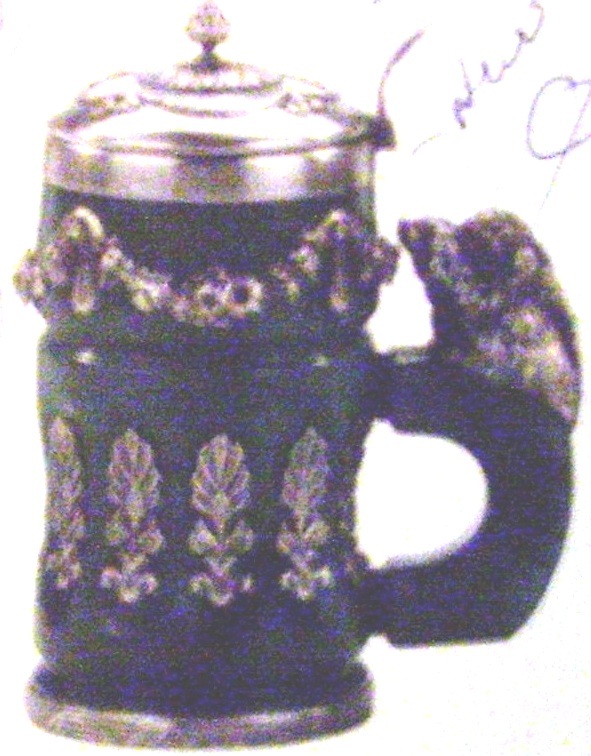 Here is a copy of the photo used for the stein above. 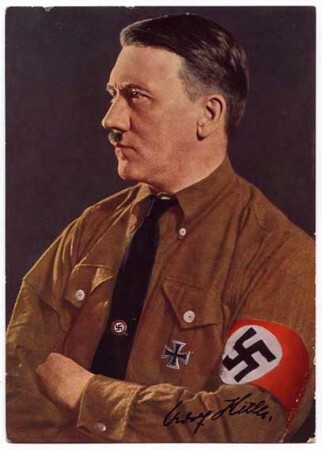 Goebbels (azi Propaganda Chief) made Adolf Hitler look 15 years younger! 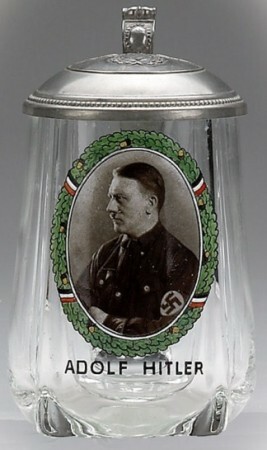 Also sold recently was this little Hitler vase / beaker. The paint appear not even to be dry yet. It was sold as authentic WWII vintage. FAKED DATE AND CENTER IMAGE WORK — – POSSIBLY ADDED LATER. 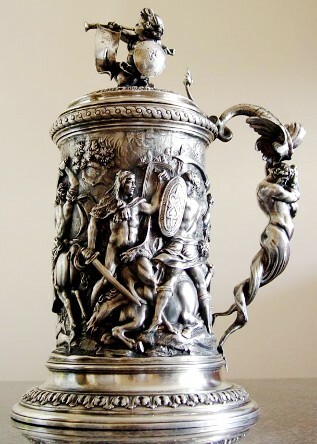 The ebay ad read ……” This large, early 17th century Pewter Stein is German and measures 13cm in diameter, at the base, with an overall height of 33.5cm. (5” by 13 ¼”) I have looked on the bottom, and along the top edge, hoping to find some touch-marks, but there are none. 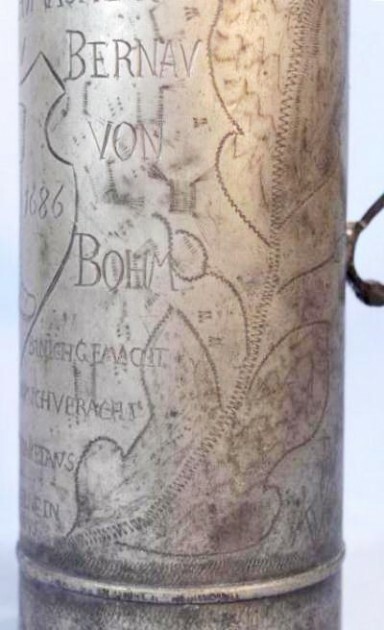 There is a large hand engraved design with lots of German names. In the middle is a shield with a Cavalry Boot and Spurs. On either side it reads, “Anno Christi 1686.” Around this shield are many German names and a phrase down on the bottom that I have not been able to completely decipher. There is also what I believe to be a Donkey, but it couple be a fox or a goat engraved right underneath the handle. 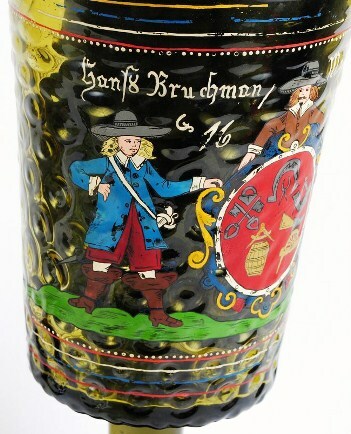 The lid is signed, “Hinrich Peters 1690.” Do you know what the engravings on this stein are about? I figure it is either military or school related, but this is just a guess. 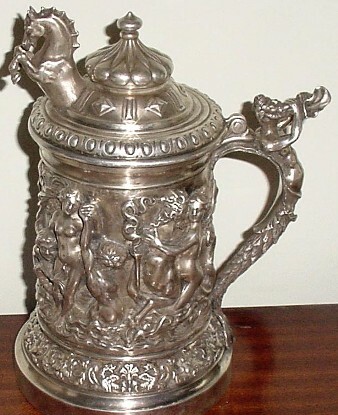 What I can tell you is that this antique 17th century Pewter Stein is in very good, original condition and there are no repairs. This style stein with it’s (a) “Bun” lid, (b) tall straight sides with ‘mostly’ only one filet about 2/3rds the way down the body (a few have two), and (c) a heavy flat base, (d) a molded relief design on the handle were only made in the area of Ostfriesland (Germany, on the Baltic Sea) and a few to the west in the north of the Netherlands. The lid’s date of 1690 would normally be “very suspect” to start with as fakers like to use the earliest dates to get the buyer’s attention! The even earlier date next to the boot makes it a little more suspect! According to those shown in “Pewter of the Western World” this was verified. However (upon further review) some of J. Vogt’s catalogs show them starting from the very early 1700’s, and I assume that style became more accepted by the 1700’s. I have never personally seen one of these dated that early, although I have one in my files that has the date 1677. Shown as BFS’ in The Compendium. 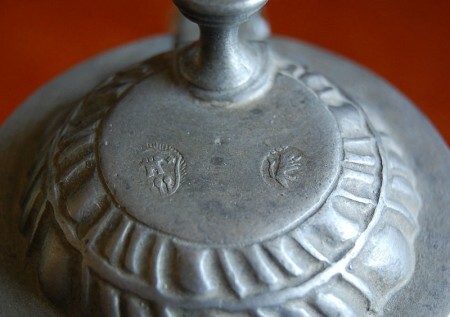 The one in “FWTD” with that style stamped design on the handle = “X’s and Dots”, is dated 1808 in the mark. The other one I have that look more like this one has the herring bone design, but the mark gives no clue as to age. There is light wriggle work line decoration , in “drapery” style, all around the top of the body. The (new?) engraved writing cuts into that. There is light wriggle work line decoration on the sides in the form of flowers.The (new?) engraved writing at the middle cuts into that. The cutting making the shield – it isn’t even wriggle work! Now nothing says it has to be, but in my experience most wriggle work is done all over the stein, in about the same sizes and by the same hand. The small words below the main scene cut into, and overlap the old wriggle worked flowers on the side, seen on right side – facing, photo. The workmanship on the Shield and that boot definitely do not match the style of “The Lamb of God” under the handle does not even come close. That’s some of the “roughness” I was talking about in . 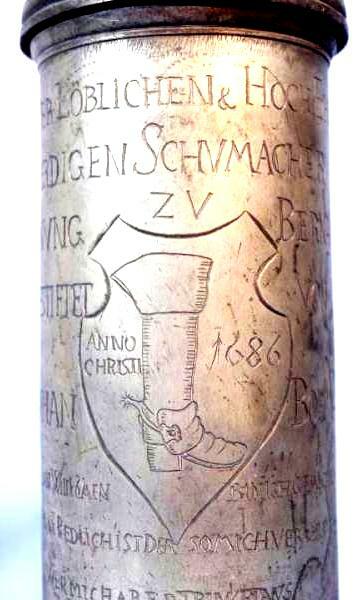 Seller says, “on either side it reads: “Anno Christi 1686.” (I couldn’t see them, only the one in the shield.) I guess there could be an original reason for that but I’ve only ever seen one date advertised. I think perhaps someone (forger?) was trying to over play the date, to make it more attractive perhaps ? Given all of above: There is no reason in my mind that any guild-master would order a stein with all the wriggle work already on it! 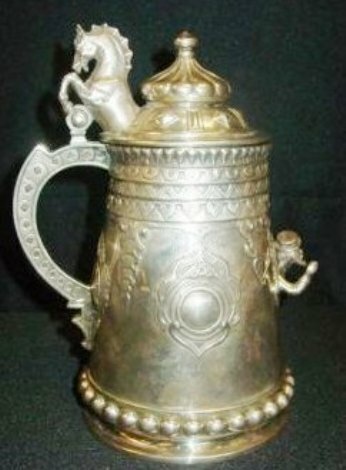 Their Guild Stein would have been a custom design supplied to the pewterer for use on a brand new stein. They just would not buy second hand stuff! There is no reason to think that this Shoe Maker’s Guild would have dissolved in only4 years and the new owner put his name on the lid at that time = 1690. …………………….BUT given all of the above, I think I’ll save my money for some other neat piece that is bound to come along at any moment and take my life savings of $11.00 away! ANY COMMENTS? PLEASE DO WRITE . 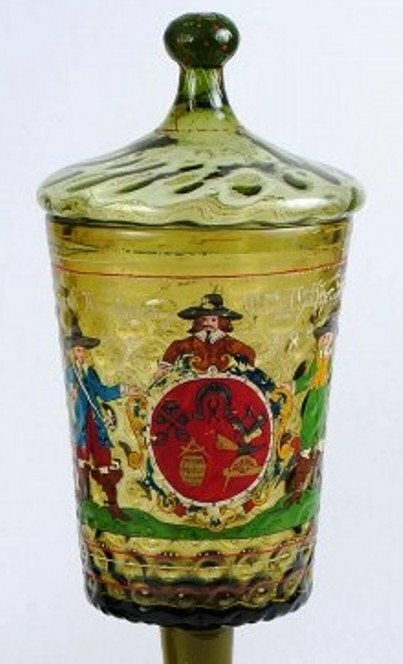 ENAMELED GUILD CUP DATED 1658. Now I have to admit when first posted on eBay this piece raised a few eyebrows! 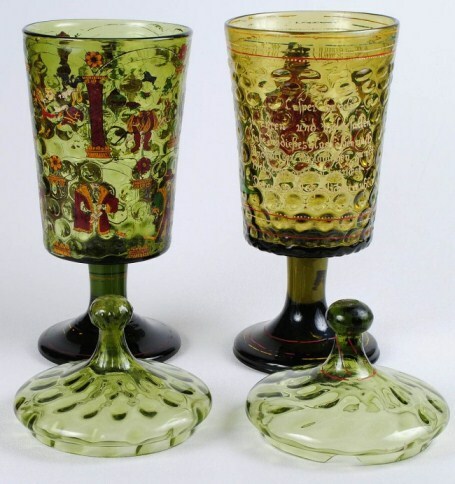 It had not been seen by any of my circle of old glass collecting friends. Recently a friend of mine. Dennis, who constantly surfs the WWW in order to learn ( and pick up stuff dirt cheap!) saw the above being sold at a USa general Auction. Detail of the slight variations of colors on the piece shown above, but everything else is the same. ……………………………………………. AWPD – TO BE CONTINUED …………………………………………….